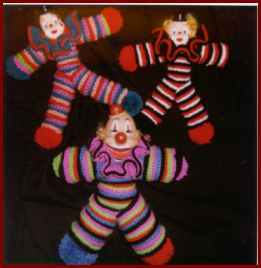 my clowns are 100 percent acrylic, safe for children of all ages and adults :O) They are sure to put a smile on your face and bring a spark of sunshine. 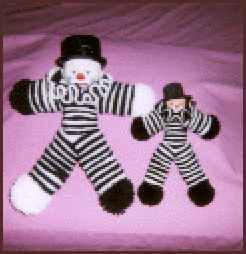 Unique Hand Crocheted Clowns by Magye - 100 percent acrylic. Safe for children of all ages. A great gift idea for the clown collector. In stock colors are multicolored or assorted. Price for small clown: $29.95. Unique Hobo Clowns by Magye - 100 percent acrylic. Safe for children of all ages. A great gift idea for the clown collector. Price for small hobo clown: $29.95. Price for large hobo clown:$39.95. for online credit card purchases. All pricing is in US funds.